Fill out our Intent-to-Apply form or join us for a recruitment session near you! Leslie Capello Appointed New Director of QUALITYstarsNY! QUALITYstarsNY is pleased to welcome Leslie Capello as the new Director of QUALITYstarsNY. Leslie joins QUALITYstarsNY after serving as the Deputy Director of Early Childhood for Children’s Aid Society in NYC. Prior to her work at Children’s Aid, Leslie served as the Early Head Start Director at Grand Street Settlement and as the Early Head Start Education Director at Educational Alliance. Leslie’s background also includes over 20 years of experience working with birth to five early care and education programs in California in a range of leadership roles, including being a classroom teacher. Leslie’s diverse experience and deep expertise in early care and education make her well suited to lead QUALITYstarsNY during this time of continued growth. We are delighted to welcome her to the QUALITYstarsNY family! QUALITYstarsNY is rapidly growing and is once again open for recruitment in New York City, increasing capacity to help New York’s highest need communities. If you're an early childhood provider in the South Bronx, East Harlem, Brownsville, Sunset Park, East New York and Staten Island's North Shore, you can express your interest by filling out an Intent-to-Apply form or by joining us for a recruitment session near you! Request print copies of the brochure. We encourage you to share the brochure with your colleagues, and the families of the children you serve! Not a currently participating site? Are you interested in learning more about participating? Download the guide to learn what your program can do NOW to get ready for QUALITYstarsNY! We're currently recruiting, so let us know about your program if you'd like to apply! We are pleased to announce the release of the results of the first-ever comparative analysis of performance data on programs participating in QUALITYstarsNY. 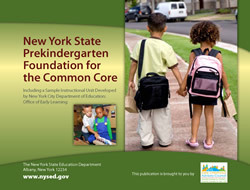 QUALITYstarsNY: New York State’s Bold Step to Ensure Access to Excellence in Early Childhood Education details the results of a three-year assessment of almost 200 programs participating in QUALITYstarsNY. The Aspire Registry is New York's registry for early childhood professionals. Joining has great benefits for both programs and staff, and is also required for participation in QUALITYstarsNY. 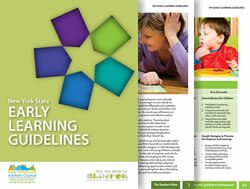 The NYS Early Childhood Advisory Council (ECAC) has produced three foundational publications for early childhood educators. Access a free electronic copy below or place an order to purchase printed versions.